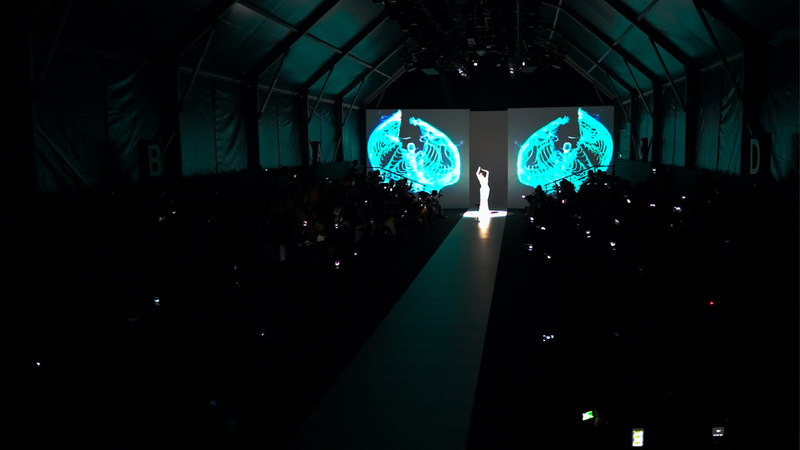 The interactive fashion show at Shanghai Fashion Week was the culmination of three months of work, combining three separate projects into one final show. The first project was a Kinect installation called xFracture, inspired by TNC's autumn collection. A blend of x-rays and intricate pattern drawing. We used Kinect to capture the body position of people standing in front of a screen. From the viewers body grew bone like patterned sculptures. Every few seconds a x-ray flash would reveal a skeleton. For the second project we made a film of the visualisations projected on to a model. 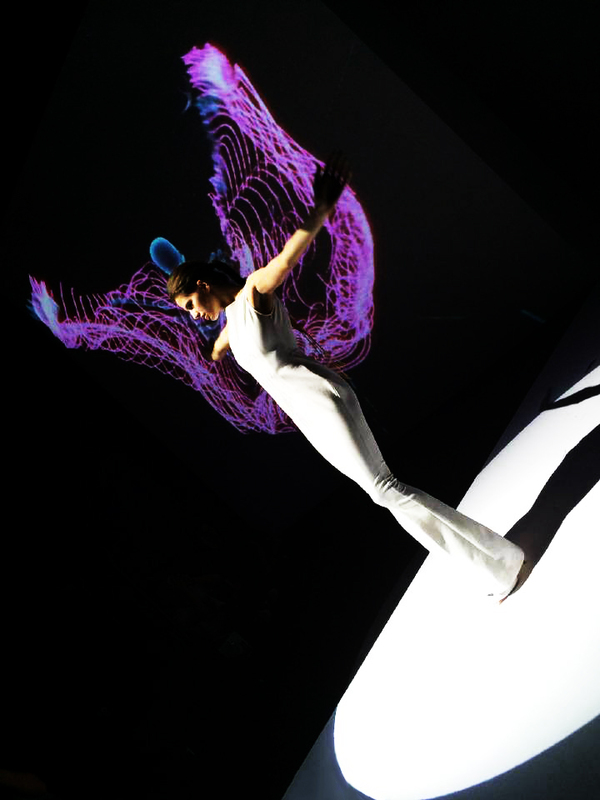 Specially developed software meant that the model could move and be tracked in real-time, the projections would automatically shine that pattern on to her body. 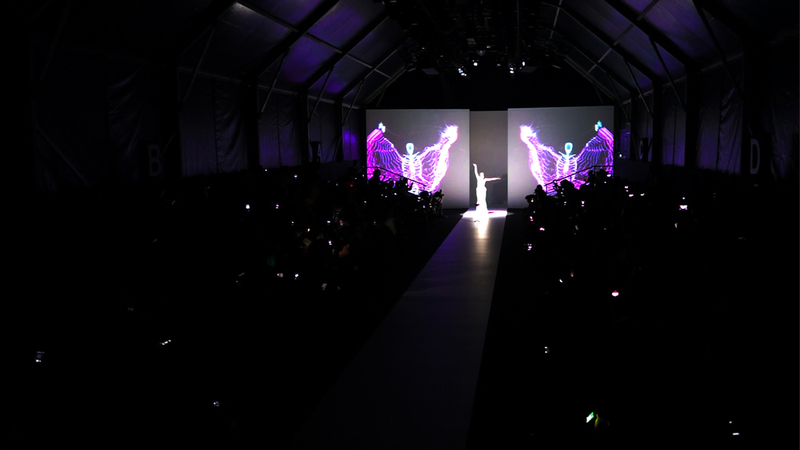 The film was then edited and prepared for Shanghai Fashion Week. It was decided that for the final show at Shanghai Fashion Week the films would be shown as well as an interactive piece. Two projections either side of the runway were used to display a giant skeleton that was mapped to a model's movement. The skeleton glowed blue and had spline wings that grew in size as the model lifted her arms. Particles shot from the skeleton in the direction that movement was detected. This was the first time we used a Kinect on a fashion runway, and possibly the first time ever that a Kinect One has been used in this way. After the fashion show was over, we set up a Kinect installation in the showroom for people to try for themselves. The response in China was incredible, it made a big splash on Weibo.